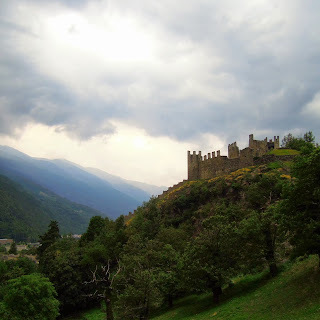 With a pleasant twist of flying-standby fate, my parents were forced to fly into Italy earlier than expected for a long-anticipated visit, which means that John and I have an extra two days with them here in the Alps. Oh yes, find a job working for the airlines and you, too, can visit your children in Europe for less money than a road trip to the next state over. Just a casual evening walk through ancient churches and the Italian Alps. We do this every night. Trekking up to nearby Teglio, a 30-minute uphill walk (single file style optional). For $50 a night in a B&B that's only five minutes away, we've realized that this should've been the plan to begin with. And since the only plans for the weekend are to house/petsit while Paolo and Marisa take their prize-winning Bernese "Doc" to an international dog show in Switzerland, things couldn't have worked out better. To show our appreciation for their overseas trek, John and I decided on a home-cooked meal using Paolo's pioda. The pioda is a large flat stone that was historically the roofing of choice for this area because it was abundantly mined from the surrounding Valtellina Valley (although cheaper and easier—though not necessarily better— methods have become the norm since then). Eventually, some crafty Italian figured out that the stone would also make a perfect source for grilling. Word spread, and this big beautiful hot plate of stone was born for all of your grilling needs. 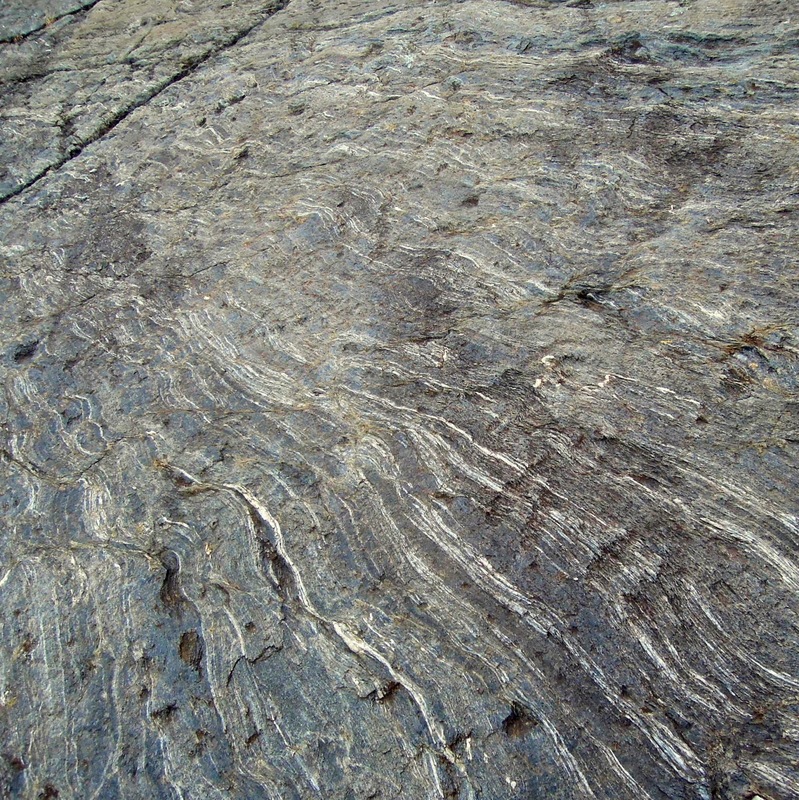 The pioda stone as roofing! When used for cooking, it's typically two inches thick and should be taken care of like a cast iron skillet. The pioda is kept low to the ground in order to keep the fire directly underneath. Here we have one of Paolo's fresh-caught meals. River trout rubbed with local herbs. The food ends up being infused with the scent of the smoking wood that burns directly underneath, but without grill grates, whatever you're cooking seems to maintain moisture especially well yet remain perfectly crisp. I took a page from Paolo's book and made a revised pesto with parsley and salt-brined capers thrown in with basil and EVOO, which was a fresh and fitting spread for both the grilled meat and the vegetables. With Paolo's rather "hearty" cooking absent for the weekend, we opted for a vegetable bonanza. Keeping dessert simple, we opted for local chestnut honey , the first figs of the season (praise Jesus! ), a hunk of 24-month Parmigiano Reggiano , and a layered "cake" of gorgonzola dolce and mascarpone. The first place we hit when mom and dad arrived: the Sondrio food market, of course. The lighting may be poor, but luckily that has nothing to do with flavor. This is what honey is made for (thanks bees). Life away from home and family can be hard. 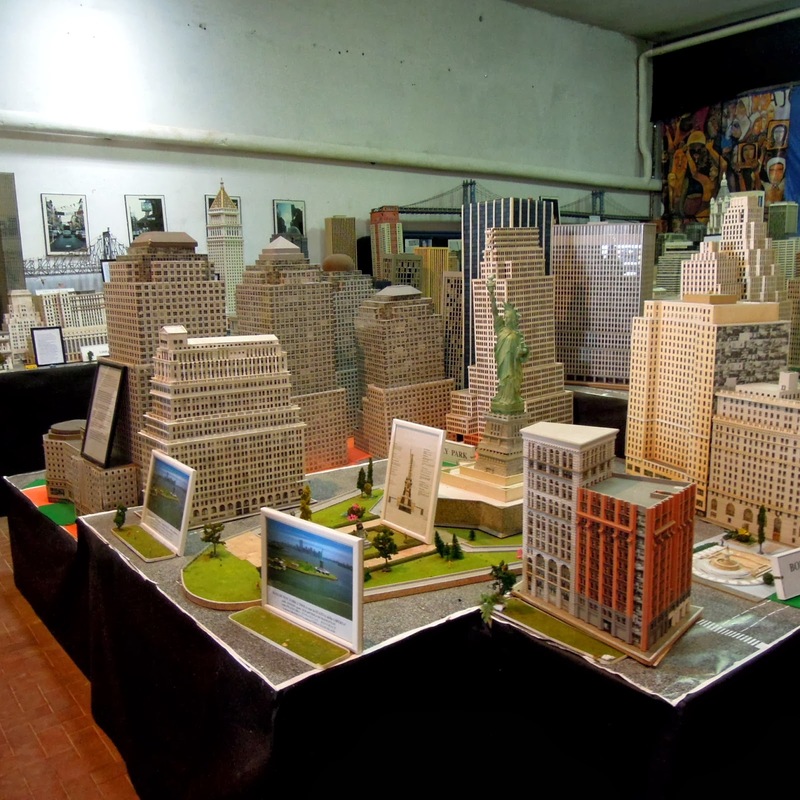 It can be amazing, but it can be hard. It's nice to have the folks around. Ca Branchi was my parents fantastic B&B that sits just below the town of Teglio and is run, aptly, by a Swiss woman named Heidi. It's a bit out of the way, but the views are worth it. If you're interested in booking, don't judge the place based off its sorely out-of-date website. 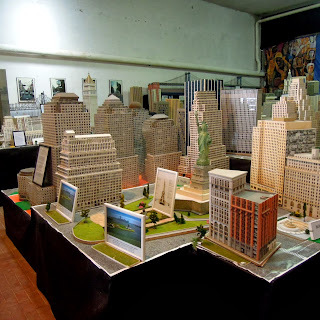 Take my word, it's worth a visit! 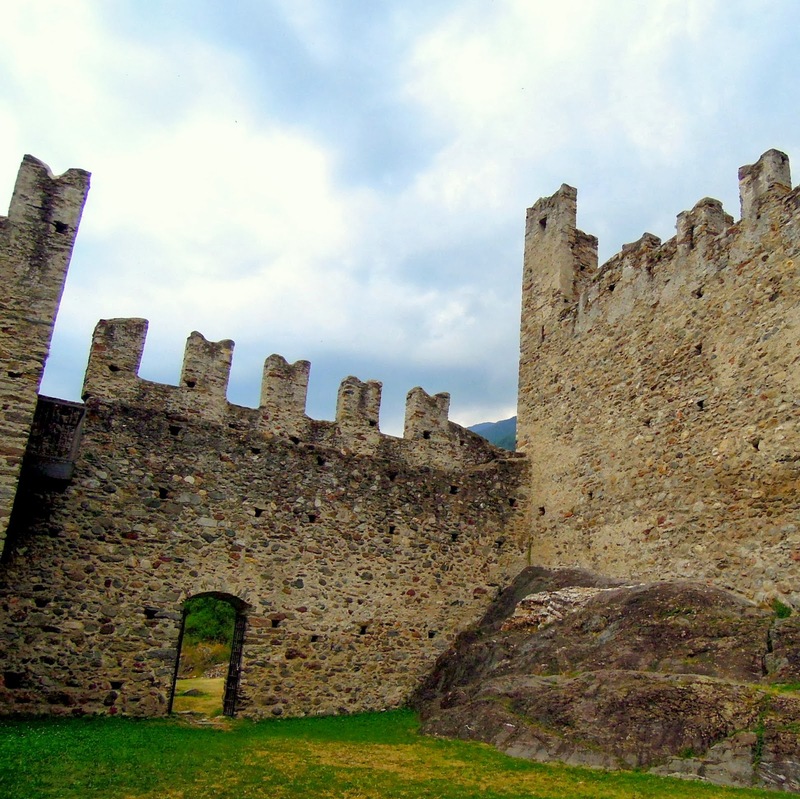 Tomorrow we celebrate the anniversary of the day Teglio made peace with Switzerland, some 500 years ago. Huzzah, history! Three aging bananas sat staring at me in Paolo's kitchen, and I knew something had to be done. Let it be said: bananas are an amazing and tasty fruit. You know this. Monkeys know this. Nonetheless, I am typically not in favor of banana consumption because of the miles undertaken to get a banana from point A to B (say, for example, Peru to Italy). Those miles are paid for in more ways than your .60 cents per pound bounty. Can you guess what it is that I decided had to be done?? But . . . I didn't purchase these bananas, so am I such a hypocrite if I consume them before they go bad? And am I so terrible if I guiltily enjoy this occasion of being forced to save bananas from a disgraceful, wasted end? And if it happens to be the case that you have candied walnuts , you know what to do. The excitement of living in a region that produces buckwheat flour and chestnut flour has yet to wear off (see my chestnut buckwheat bread recipe), and so I smiled a bittersweet and salivating smile as I began improvising Chestnut Buckwheat Banana Bread. You can probably substitute any flour for this recipe, but if you can track down buckwheat and chestnut flour , I suggest following my lead. But, keep the chestnut ratio around 2/3rd because of its tendency to brown quickly. Whether or not it matters to you that this recipe is gluten free, it is. But that's neither here nor there, because why use regular flour if you can have the hearty flavor of buckwheat and the sweet nuttiness of chestnut (um, and it's healthier)? Also note that I omit any sugar because I like to drizzle [local] honey over my bread. Like a boss. Yeah, I guess this is an ok spot to eat this completely Italian version of banana bread. Fine. Preheat oven to 350 F/180 C. Grease a bread pan or, in my case, a bundt pan. Whisk egg, lemon juice, milk, and EVOO together. Mash bananas into a puree and whisk in with the liquids. Stir this into the flour mixture until just combined, then fold in walnuts or chocolate chips, if using. Pour the batter into the greased pan and bake for about 30-40 minutes, until a toothpick comes out relatively clean. Easy breezy. ok, so I undercooked this a bit. But I like a moist banana bread, and so did all of the mouths that tried this. The bread comes out moist, almost cakey, but without any added sweeteners (thanks, natural sweetness of bananas and chestnuts!). Drizzle it with honey when just out of the oven for a glazed look, or if you just so happen to have candied walnuts on-hand, sprinkle away, my friend. I know this is an odd way to close out a post centering on bananas, but I humbly request that you not put yourself in a situation where you can make this recipe. If you'd like to read another great opinion on why you should stay away from bananas unless you're in a country that grows them and they come from a fair trade source, read Darya Rose's opinion here. 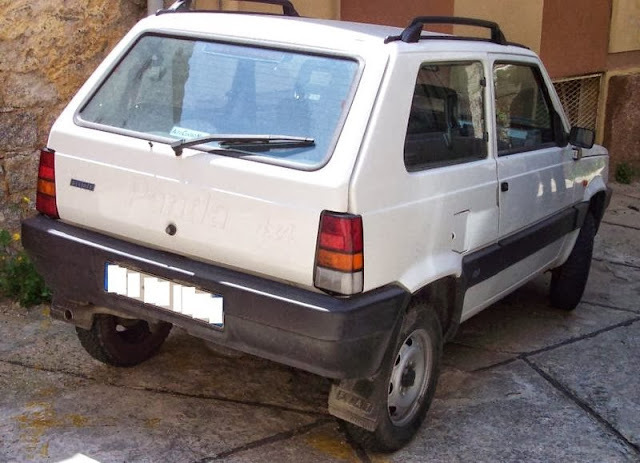 When someone gives you the keys to their '91 Fiat Panda, you don't just shrug the offer off. You grab said keys, stick 'em in the ignition, and head off deliriously into the mountains and valleys of Northeast Italy. Teglio, the tiny mountain town on the outskirts of which John and I are currently volunteering, is the rustic neighbor to two also rustic mountain towns called Grosio and Tirano. All live in the happy province of Sondrio, which is also the name of the largest city in the area. If you're in Italy's Lombardy region or even Southeast Switzerland, Grosio and Tirano are two great day trip options running along the Italian-Swiss border. Heading up from Sondrio on SS38 you'll nudge your way into Tirano after about 15 miles of beautiful scenery that runs along the Adda River. 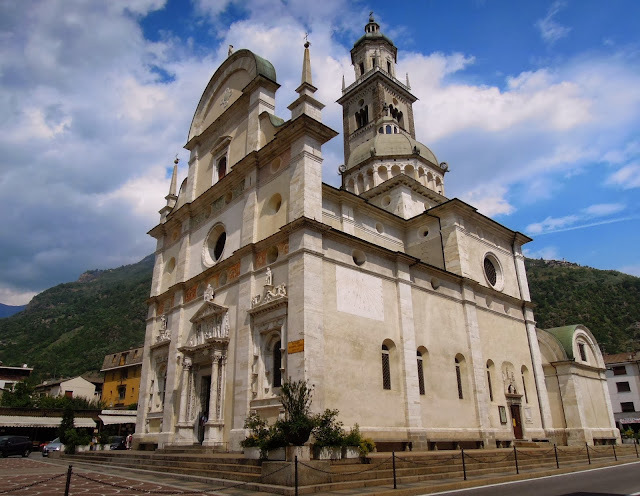 The Basilica of the Santuario Madonna di Tirano is the grand landmark to let you know you've reached Tirano, so hop out of your car and walk around the cute square over which it presides. 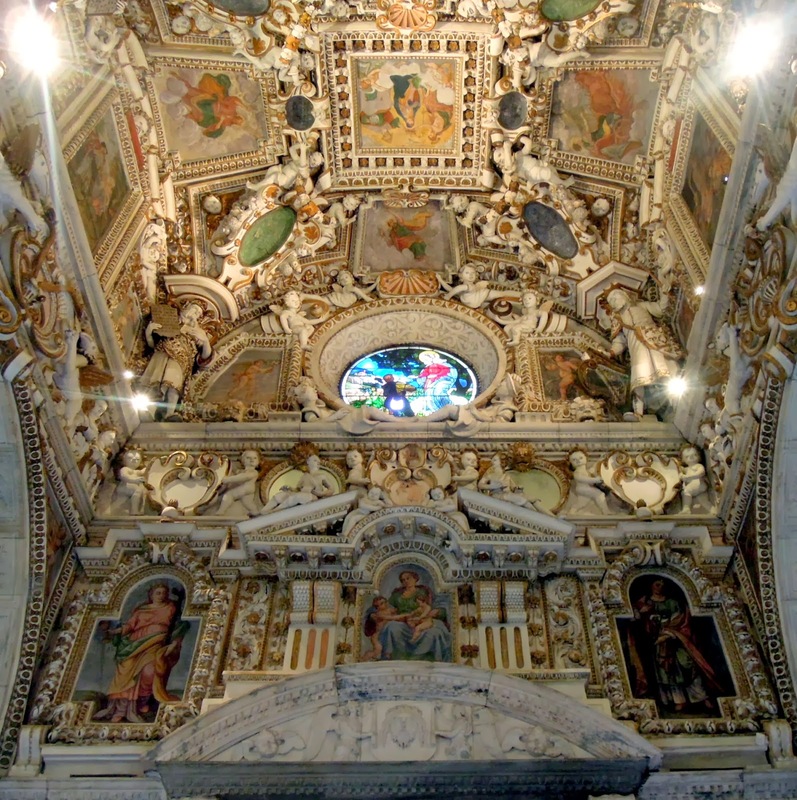 The Madonna di Tirano, which was begun in 1504 after the Virgin Mary herself appeared at a feast and requested that it be done. 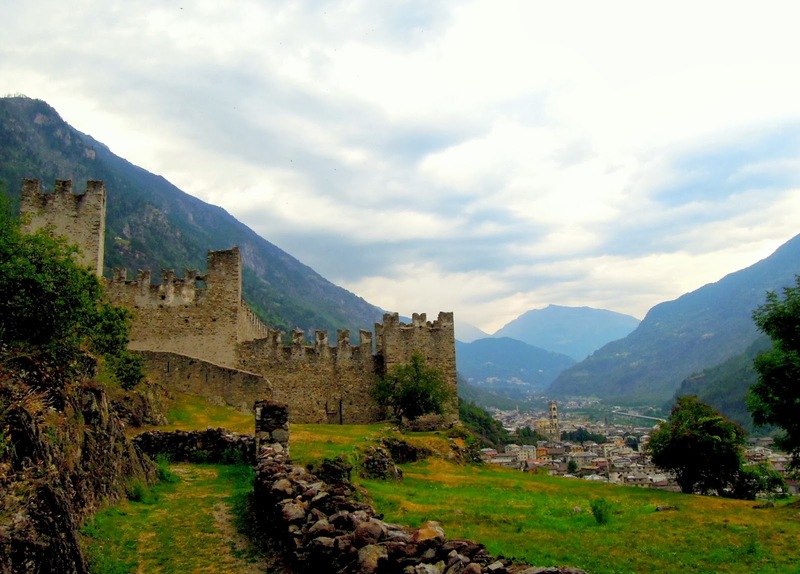 This first area is Tirano's historical center and it has several restaurants with views of the square and surrounding mountains. We stopped at Ristorante La Botte for the local specialty, pizzoccheri (peas-oh-care-ee), a buckwheat pasta with a butter sauce, chunks of regional cheese, and usually savoy cabbage and potato mixed in. 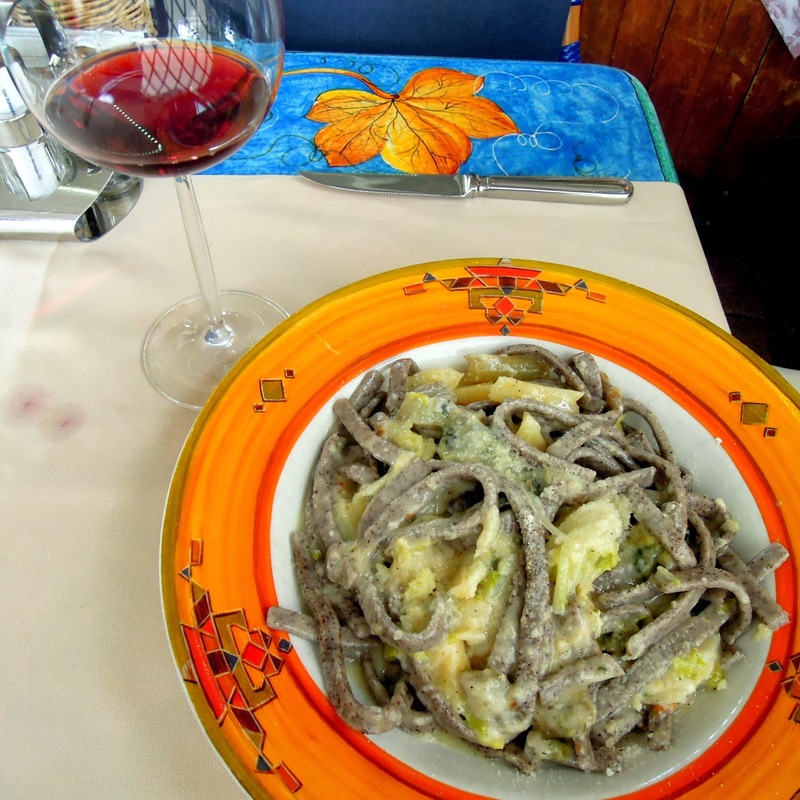 It is, essentially, the richest pasta dish you'll ever eat, and you absolutely mustn't miss it when you're in the Valtellina Valley region. 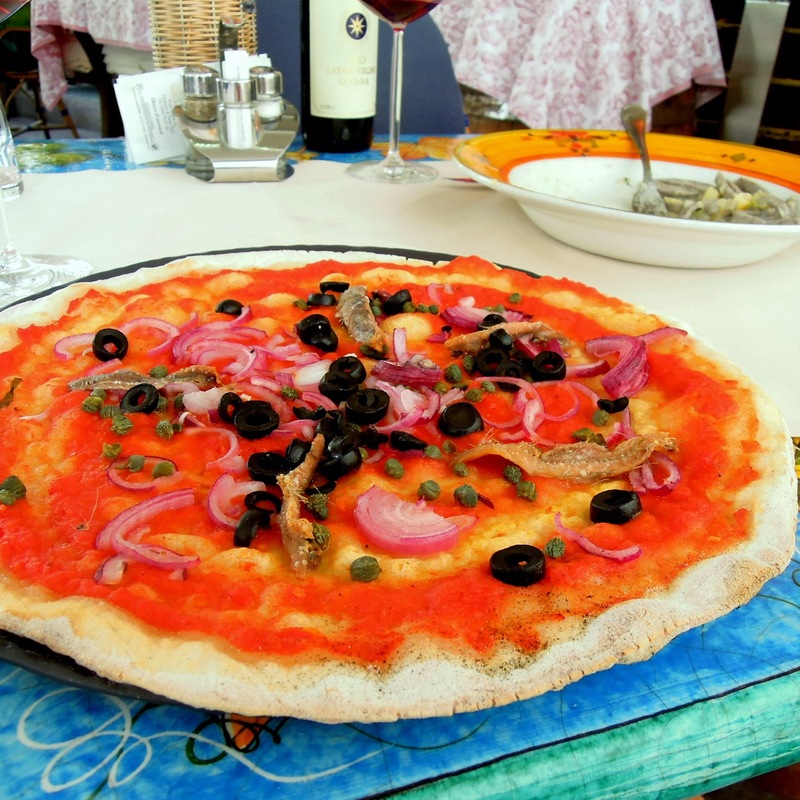 A pizza with tomato, red onion, olives, capers, and anchovies. Salt much? About a half mile's walk past the historical center you'll come upon a more revamped Tirano with lots more shops and restaurants, but be warned that it's much less charming than the "old" section, as revamped things often tend to be. 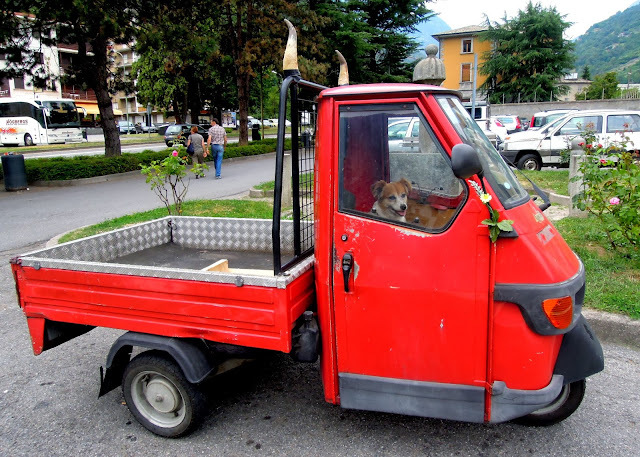 Nothing, though, is as charming as this tiny dog in this tiny truck. Tirano's main claim to fame is that the Bernina Express stops there and runs to and from Switzerland's Chur, crossing some of the Alps' most stunning vistas in the process. The train's huge windows allow you to see fantastic scenery from glaciers to mountain lakes; some sections even have the honor of being dubbed World Heritage Sites. Another view of the cieling of the Madonna di Tirano. Can we go back to doing things like this? After a stroll and maybe some lunch in Tirano, continue on SS38 (and then SS78) for about 15 minutes until you arrive to Grosio. 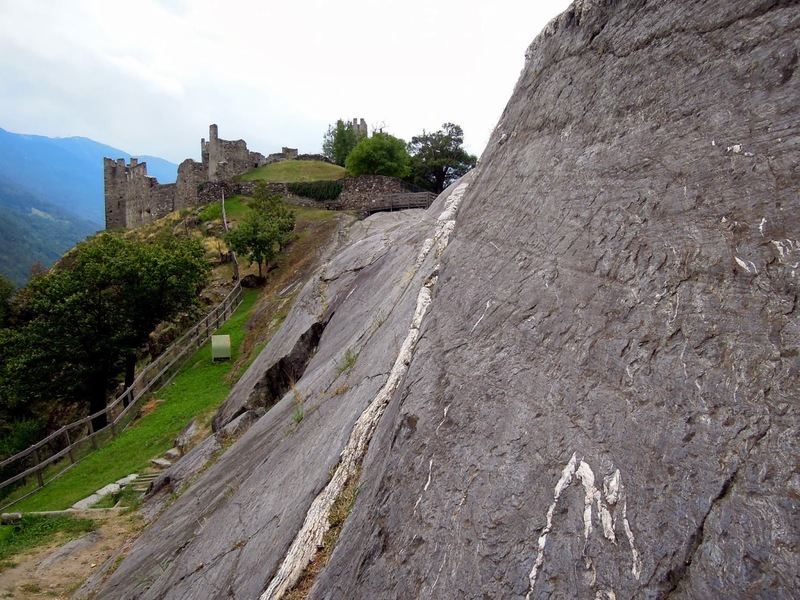 Now, I've told you to lunch in Tirano, because the main thing Grosio has going for it is the amazing Rock Engraving Park (Il Parco delle Incisioni Rupestri). Lack of restaurants aside, this town is absolutely worth a visit. La Rupe Magna, 275 feet long by 115 wide, is majestically shaped like a breaching whale. 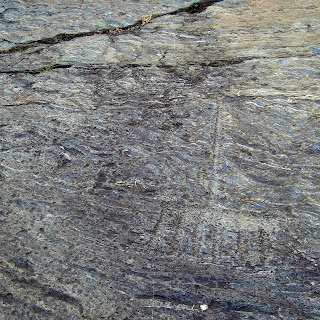 It's covered with thousands of nearly-hidden engravings, and if you take off your shoes (which gives a nice primal feeling to everything) you're allowed to hunt them down yourself. 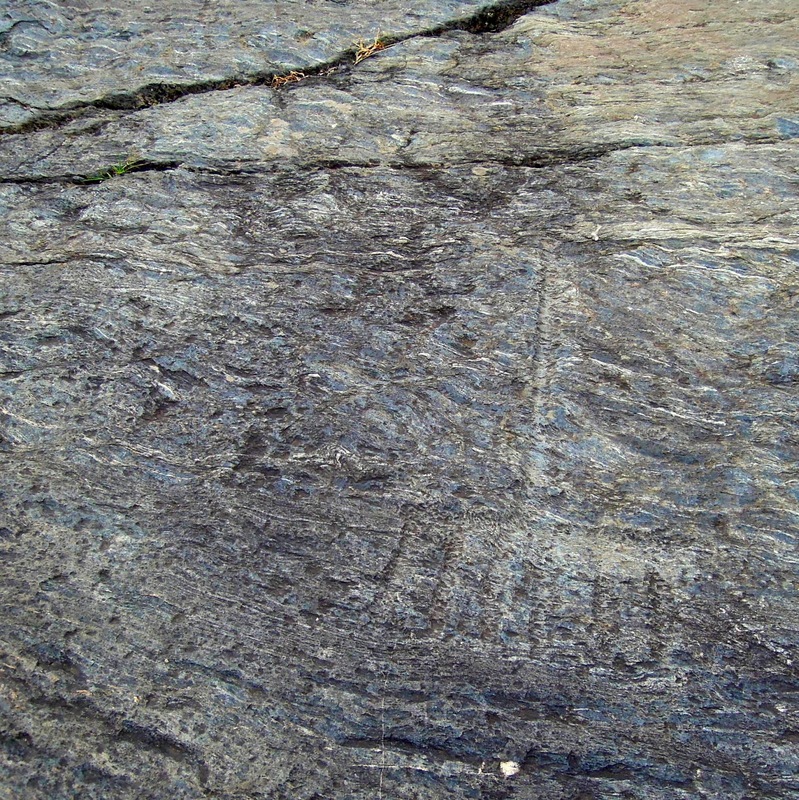 The park is home to a huge rock with more than 5,000 engraved figures from between the Neolithic and Iron ages (IV mill. BC - I mill. BC) carved along its face. Set aside at least half an hour to search them out, though, because we struggled to find any at all. Just past the rock you'll find Castle Hill, which is dominated by the Old Castle of San Faustino (X - XI century) and its replacement, the "New" Visconti Castle (XIV century). Not easy to spot at first, but here you can see a rake! I think someone chose a good castle location. Note: During some periods the park is only open on weekends or is not open at all. 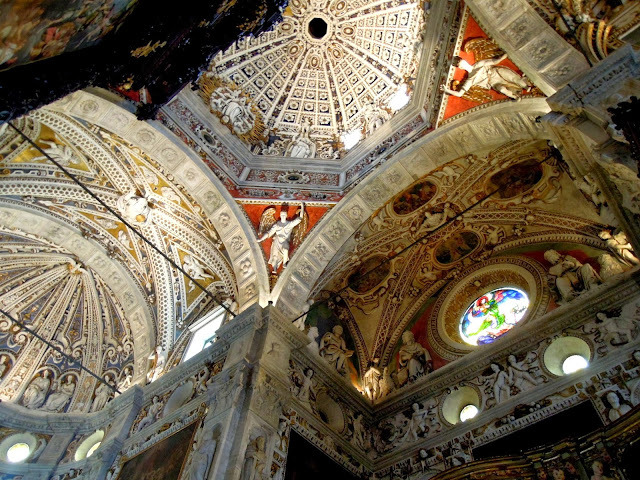 Be sure to call +39 346 333 1405 or e-mail info@parcoincisionigrosio.it for operating hours. Park entry is free. After our primal rock hunting, we stopped in the town's Valentino Pub for an affogato, then headed back to Teglio for our dogs, vineyards, and more of Paolo's fantastic food. Well folks, I'm pretty sure that my life is not real. I wake overlooking the Alps. I work with the feel of round ripening grapes underhand. And I eat—ohhh, do I eat—with the pomp and pleasure of an Italian goddess. Beats a restaurant view, wouldn't you say? Perhaps I sound melodramatic, but after fourteen months of traveling and volunteering as a means to see the world—and moreover, the world's food—we've happened upon one of those rare and delectable exchanges for which I'd initially set out searching. There's a nearly limitless amount of work that I would do for this: melon, gorgonzola/mascarpone "cake," and lardo . 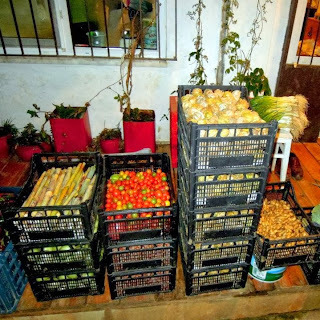 When I began arranging this trip, the word "farm work" produced visions of produce planting, harvesting, eating local food at every meal, and other expectations that turned out to be overly-idealistic. Not to say we didn't learn things, because overall we're walking away with loads of new farming and general life knowledge. Yet overall, the reality of volunteering on other peoples' "farms" often turned out to be something more like weeding, weeding, cleaning, clearing, weeding, and maybe some local foods thrown in here and there. 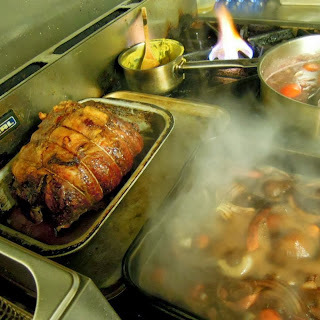 Exception #2) Pub life at the Grampus Inn was pretty luscious: Eating off the menu full of local foods, real ales, and a Sunday Roast in exchange for kitchen/cleaning help. It's not that these programs (see HelpX, Workaway, and Wwoof) for volunteering on farms are some sort of sham, it's just that maybe I wasn't choosing big enough farms, maybe I wasn't reading between the lines to deduce what we would really be doing, and maybe the people who love food the way I do are just fewer and farther between than what I thought. Rule: If you love food, buy whole chunks of cured meat (e.g. speck), a personal meat slicer (obviously), and slice it just before eating for best flavor. At any rate, we know now what to look for when we peruse the host profiles in search of an experience worth traveling for (a post on those specifics soon), and our experience has paid off with Paolo and Marisa. Our four to five hours spent in the vineyard is the type of work in which you lose yourself, reaching an almost meditative state after enough hours of leaf clearing and vine straightening. At the end of the day, you've helped something beautiful and ancient go on living, and it feels good. This is also kind of how you feel at the end of the day. Do you know what else feels good? Paolo's cooking. Besides giving us a bedroom with a stunning view of snow-capped Italian Alps, the real way in which he gives meaning to the word "exchange" is though the heart he puts into our meals. I hope you're hungry: Authentic Italian risotto with sausage and mushrooms. Paolo (not to be confused with the "Paleo" diet trend) Style. And it's your lucky day, because he's just shared a big one with us. Now, I know that this is hard for us English-speaking cultures to hear, but Italians don't really use exact measurements. Cooking is fluid, adjustable, and romantic; there must always be room for change and improvisation. So, use the following recipe as a guide, but when it comes down to it, follow your intuition, and don't worry if it takes a few tries to find your own perfect risotto recipe. IF I were doing a life metaphor here, it would be delicious (eyerolls invited). In a tall, thick pot, warm the 2 cups of water until it has nearly begun to simmer. Turn off the heat and add the mushrooms (if they're quite large, tear them while dry or chop them down to a more manageable size afterwards), soak for an hour (use a steamer basket for easy removal). After, strain out the mushrooms, set aside and add the beef stock to the now-mushroom-flavored water. Bring stock back to a low boil. Meanwhile, in a large separate sauté pan, heat 2 tbsp butter and 2 tbsp EVOO over medium heat, then add garlic. Sautée for about a minute, then add chopped sausages and mushrooms. Stir continuously until sausages are browned. Add the rice and stir continuously to evenly toast it in the sausage fat. Add thyme. When rice is transparent, turn heat to low and add about 1.5 cups of the hot stock (this maintains the rice temperature) and stir. Keep uncovered and allow to constantly simmer. Slowly add more stock as the rice absorbs the liquid (the stock should come up to just below the top layer of rice). Stir occasionally to keep the rice from sticking to the bottom. Begin to taste the rice as you notice it getting soft (25-30 minutes), when it's just about al dente, stop adding liquid and let most of the remaining stock simmer away, stirring occasionally. You want a creamy textured end product, while remembering that the rice will continue to absorb liquid until it is either over-cooked or until you've found the perfect liquid ratio. When you hit the magic moment, turn off heat and add 2 tbsp butter and grated parmigiano-reggiano, stir to melt. Cover for one minute, then serve! Don't know what to serve as a side for your protein and carb rich main course? How about some cured beef bresaola? What I like about this recipe is it's simplicity. There are only five main ingredients and the process is incredibly easy; you don't even have to stir constantly. I'm not usually a rice person, but this is something I could eat weekly. By weekly I mean daily. Day Trips to Bormio...and Italian Line Dancing?